The International Independent Showmen’s Museum has on display a 1950 Allan Herschell American Beauty Carousel donated by Jim Frederiksen. This is a two abreast (Two Horses Across – there are Three Abreast models too) Kiddie Carousel. The horses are made of cast aluminum and not wood that is carved. The horses on the American Beauty Herschell Kiddie Carousel were indestructible and made for durability. This particular 1950 Allan Herschell American Beauty Carousel is easy to set up and transport from fairground to fairground. Carousels are fanciful descendants of Old World jousting machines that medieval knights used to practice their sport. The carousels you are familiar with today were pioneered by immigrant carvers who perfected their art in America. The first to open shop was Gustav Dentzel in 1867 in Philadelphia, soon followed by Charles Looff, Charles Carmel and Marcus Illions in Brooklyn, N.Y. In carousel workshops, craftsmen built the horses with hollow bodies and solid legs and heads, which were joined with wooden dowels and glue. Master carvers added decorative accents and flourishes. Some horses are elaborately decorated with gold-leaf manes, inlaid jewels, and patriotic flags and eagles. Others are relatively plain and small, designed for easy transportation for carnivals. 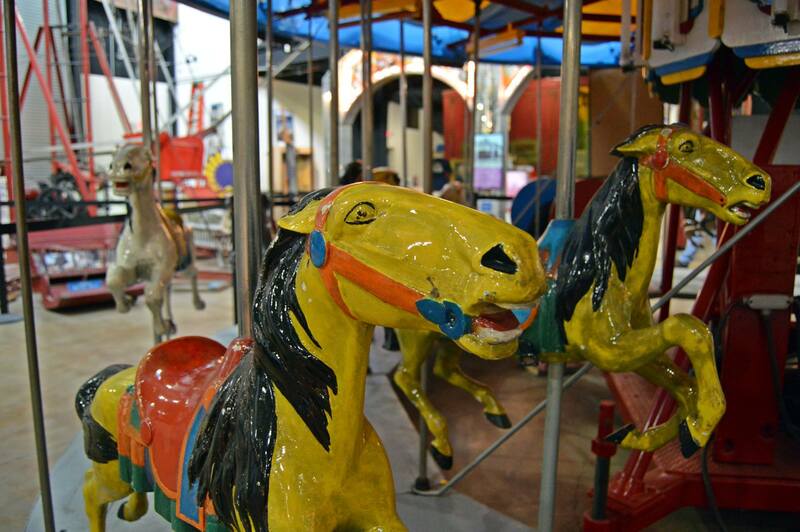 Nearly 3,000 portable carousels were made from 1915 to 1959 by The Allan Herschell Co. in North Tonawanda, N.Y. Today, the factory houses a museum, featuring two operating carousels and an extensive collection of carousel animals. The North Tonawanda companies were prolific carousel carvers in the Country Fair style. Their horses are relatively simple, easy to move and spread widely throughout the country. Most carousels away from the Eastern Coastal resorts were either North Tonawanda or Parker. 1892 Armitage Herschell on track machine, St. Louis, MO. Allan Herschell and James Armitage operated from about 1892 through 1902, carving a great number of portable carousels of a fairly simple style. Their steam riding galleries still exist at Willowbrook Village in Maine and in Greenville, Mississippi. The financial problems of the Armitage Herschell Company caused Herschell to leave and form a new company in 1900 with his Spillman in-laws. This factory started by carving and creating carousels in the old style and also created some large park machines, generally elaborate menagerie carousels. The Herschell Spillman factory created 18 separate menagerie animals, most of which were on each of the larger carousels. Herschell Spillman menageries can be found all across the country, including Ocean City, Maryland, Golden Gate Park, San Francisco, California, and Greenfield Village near Detroit, Michigan. In the early 1920s, Herschell Spillman changed its name to Spillman but continued with a similar style of carving. Later Spillman machines were mostly all horses, although some menagerie carousels were made. The large Spillman carousel which still operates in Griffith Park, Los Angeles, was said to be the inspiration for Disneyland and the Disneyland carousel. Other Spillman carousels are at Shelby, North Carolina, and the Strong Museum in Rochester, New York. 1924 Allan Herschell, Chavis Park, Raleigh, N.C.In 1913 Herschell left the Herschell Spillman Company and formed his own competing company. Herschell created mostly portable machines with rigid poses on his horses which enabled them to be packed up and moved to the next town efficiently and with minimal damage. His most recognized carving is the “Trojan”, a large-headed cropped mane horse. Six Herschell carousels can be seen in and around Binghamton, New York, all donated to the communities by the local shoe magnate Johnson family. Another is at the Cheyenne Mountain Zoo in Colorado Springs, Colorado. 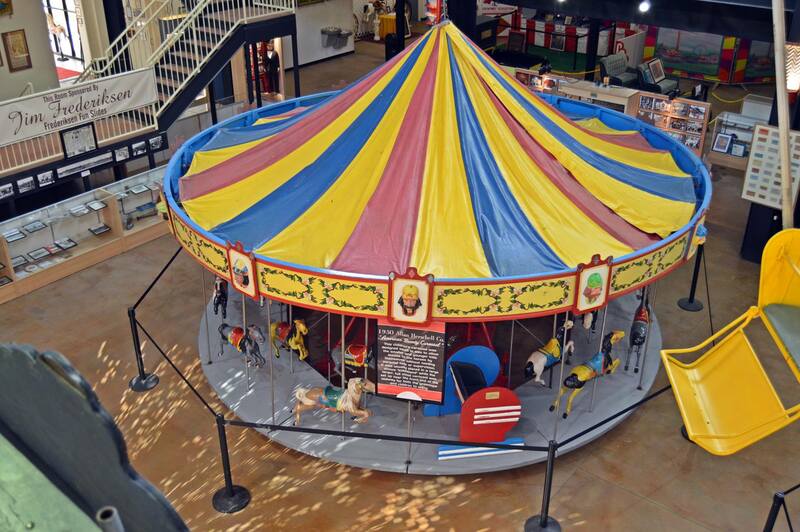 We are extremely lucky to have one on display at the museum – come visit and take a look at this 1950 American Beauty Allan Herschell Kiddie Carousel.